I'm sorry that I have not answered your comments. I have only just got my laptop back from laptop hospital. Hopefully all is well now. I have been bereft and really missed you all. I will be on catch-up for several days, reading my favourite blogs and a few new ones on the way. You know how that goes don't you? you visit blog A and see a comment by a follower B and click on their face and suddenly you have been all over the world and several hours have disappeared. Anyway here I am and I must welcome Janice Foehring on Bloglovin and Lilacgumtree and Matt Jarvis on the Follower bar. Matt is a neighbour of mine, so I bet you will get the the inside story now and then from him!! I am in some haste tonight, we have been really busy in the gardens and with the bees, having had two more swarms this week. This is the end of July for heaven's sake! Mind you there is a strong honey flow which does seem a little late. 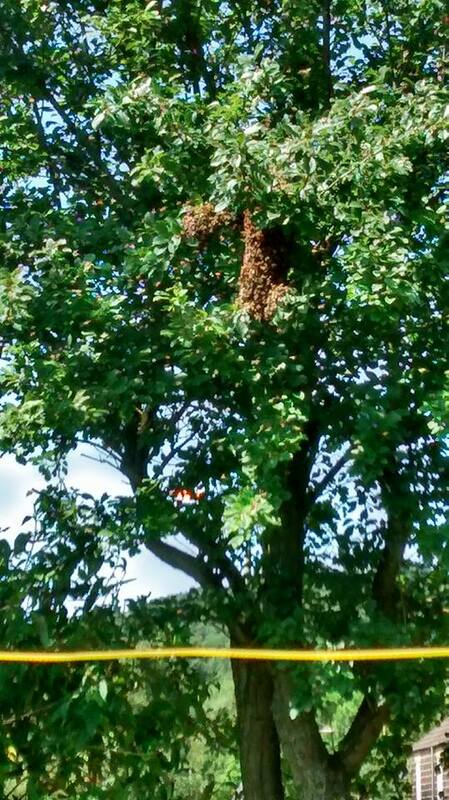 We have been unable to collect the second swarm and it is still high up in a tree. We put out a bait hive to encourage it to house itself, with no luck as they are still stuck up there for the second (cold) night. I'll let you know how they get on. We have a busy weekend in front of us. Tomorrow we off to the World Hen Racing Championships which are held at the pub where our grandson works. It is also our youngest granddaughter's birthday weekend, so we will be over there for tea. We also have to move some bees to Hathersage were they are to have a new home with some first-time beekeepers. Tomorrow morning I have a bucketful of redcurrants to process into wine, a bucketful of honey to jar for sale and some lumps of wax to melt and pour into ounce bar moulds(?) for an order. I do love this time of year. It is what we work all year for! Must go now, my hot milk calls. Especially new followers Carol, NannyAnny and Undomestic Diva on the follower bar and jangray, Bronzewing and Rebecca on Blog Lovin. It is really good to see you here. I recently saw a couple on the TV who are going to use a draw down from their pensions to travel the world. This couple both had pensions and my guess were a professional couple, probably with decent pensions. They appeared to have done their homework and good luck to them, though it is not a move that I would make, nor equity release. I must admit to being anxious about draw-down. I am concerned that some older people might be taken advantage of. You might think that I am being patronising here and that people know what they are doing. I agree that many do, but my experience as a Social Worker tells me that some older people are vulnerable from fraudsters with "investment" advice or likely to be targeted/befriended by family members and so-called friends and neighbours. "Bless him, my grandson is having a difficult time. He has finished college and would like a year out before he settles down"
"My granddaughter says that if she had a car she could get a job"
"My son needs a short term loan for a holiday. He works so hard he deserves a break"
"My nephew has been using drugs but says he isn't using them anymore and needs a bond to get himself a flat and make a new start"
Now there is nothing wrong with helping family out. That's what families are for, helping each other, but I have heard these statements and similar so many times when an older person has cashed in an insurance policy or similar. They are so pleased to be able to help their relative out and I suppose if they never see the pay out again (they probably wont) it was money they never had (though have paid into) but draw-down reduces the amount of money they need to live on in the long term and the loss of it will impinge on a person's standard of living. For those not familiar with Drawdown, put simply, a person can take a percentage of their pension pot as a lump sum. Clearly this will reduce the regular pension payments afterwards. A headline in my Sunday paper a couple of weeks ago stated that "People in their 20s have retirement mapped out - but they aren't saving" The article says that twentysomethings expect to retire at 63 on an annual income of £23,000, which many plan to spend travelling the world. They believe that they don't need to start saving until they hit 30 and almost half believe that they can rely on a state pension to give them a decent income. Just how much of that is likely?! And am I the only person who doesn't want to travel the world?! We took our first honey harvest this week. Hive No 1 yielded 60lb of honey, which is a good start. We hope to find time remove the supers from Hive No 11 and 4 today. Having seen the projections for the winter weather as a result of a very active El Nineo (how do you spell it?) I shall be kicking into Prepper mode for the next couple of months, putting stores away....oooh I do love harvest time. Enough of my ramblings for now. Daughter to the rescue wearing her big girl pants! A warm welcome to Jessica Schlenther, Rebecca, Sandy Humphreys, Striving for Simplicity and Clemcat on Bloglovin. Yesterday I was getting tarted up ( aka shower and wearing non-gardening clothes) to drive to Derby to see my youngest granddaughter's school production of "Grease"
My youngest daughter had arrived for a spot of lunch with her dad and that familiar sound and sight in the sky meant... A Swarm! The swarm quickly settled high into a large damson tree and I'm stood there knowing I can't let our granddaughter down. "You go mother, I'll help dad" says YD. I quickly collected together all they might need ( I know were everything is) and set off as YD was phoning work to negotiate a longer lunch break! This swarm was spread over three branches, which David had to cut off and lower ( or drop!) to YD individually. The bees were then shaken into a waiting brood box that David had placed in a hastily cleared site. And here is a video of them as the third branch has been shaken into the box. Note the frames to the side, these will be placed in the hive with the others once the bees are definitely in there with their queen. Jobs a good 'un Thanks to YD for the help and the photo and video. Back soon, lots of things on my mind at the moment. Thanks for your comments on my butter making efforts. Is it something I said? I lost a couple of followers this week, surely butter making isn't that controversial! However I am pleased to welcome Laura to the follower bar. Hello Laura! I have started picking peas this week and am pleased that my pea plans (!) seem to be working, ensuring fresh peas for some months yet. Mind you I think peas freeze particularly well and am hoping to put some down for winter too. Here are the peas that I am growing this year. Firstly Kelevdon Wonder. I am picking these now. I notice that a few mange tout peas have found their way in among the two rows. I have no idea how they got there, but am happy with their appearance. I have used sycamore twigs to support these. Pictured here are Alderman peas these are a very tall pea, with quite a lengthy cropping season. This year I have strung baling twine across bean poles, next year I shall go back to using netting as the stringing has been quite time consuming. These peas are still growing and look as though will make 6 to 7 foot. The third pea is Sakura. this is a marrowfat pea that is grown commercially. I hope that you can see that they are self supporting, which is essential if you are growing acres of the things, and are ready more or less all at once, making them perfect for freezing or drying for the winter. I will do both. I thought I would share my, rabbit - pidgeon- cabbage white butterfly deterrrent. David made this for me last year. It is a glassless greenhouse, cobbled together with bits and pieces of old greenhouses. Last year David covered it with chicken wire to keep the rabbits off the peas in the paddock garden. This year we have moved it to the top garden and covered the whole thing with fine plastic netting. I have planted brussel sprouts in here. This way I can stake the brussels and let them grow as tall as they like (In the past the plants have often been weighed down by netting) and get in to tend to them with no problem. My final picture is of some of blackberry flowers. We have several yards of blackberries around the holding and it looks like it is going to be a bumper year. I am planning on making plenty of jellies and wine, as it also looks as though there will be plenty of damsons and apples too. I have just finished "Hovel in the Hills" a book about life on a remote Welsh hill farm, I thought life was tough for us when we moved. Next to these folk we had a walk in the park! I am looking forward to reading the next two books. Last weekend we had our annual Bash which we call our "Festival", we have been holding this party for quite a few years now. It started as a small family party (can't remember the occasion now) over the years more friends joined us and camped so that they could have a drink, the numbers grew as we and our daughters added more friends. One year it absolutely poured and someone said this is just like Glasto and the term Festival was adopted. This year there were thirty tents and a couple of hundred souls. Everyone brings a plate of food, a drink and a chair and/or a tent. This year we had four barrels of real ale which we ask for a donation of £1-50 a pint. This covers the price of the beer and if donations exceed cost the difference goes to our chosen charity. ( as does the proceeds a a little raffle we hold with gifts that guests bring if they wish. They start arriving on Thursday night and Friday night is almost as big as the day itself. This year our godson made some great braziers from tyre rims (picture to follow) and these were stood on slabs and served as campfires for groups dotted around the field. The field is now back to normal except for a tent that is to be waterproofed and the large marquee that needs some attention. Quite a few people that bought puddings also bought cartons of cream, which we keep in an electric cool box on the tables with the butter. On Sunday morning there was a litre and a half remaining so yesterday I decided to make some butter. I have made small amounts before (mostly by accident) but made an effort to make some, assessing if it was a feasible/ frugal way to make our butter. We love butter in this house and only use margarine for cooking. I am sure many of you have made butter so bear with me! Here is the double cream. I don't know how much it cost so I have googled a price site and it would probably be about £2-80 a litre (much cheaper if it was on offer of course) which equals £4-20 for these. I put this into the Kenwood and whizzed past the thick stage to the sloshy stage (when the water was thrown across the kitchen!) I strained this all through a fine sieve over a bowl. I but this liquid - buttermilk- into a measuring jug. I washed the butter in running cold water, squeazing it until the liquid ran clear from the butter. I added dampened salt and bashed it into a rough butter type shape. This weighed one and a half pounds. As you can see there was a yield of one and a half pints of buttermilk. I have split this into half pint cartons and after checking that I could do this, I have frozen it to make soda bread. Off to now try to beat the birds to the cherries and tie up the broad beans which have decided to go horizontal on me! Back soon - hopefully with my post on retirement Sue. This is not the post I was going to do today, I was going to write a "deep and meaningful" post about retirement. However I thought you might be interested in seeing what can happen to a strong hive when the weather is really hot. This morning a neighbour knocked to tell me that she thought our bees were swarming. We went into the front garden to see many bees gathered at the front of hive No 1. They were very quiet and I realised that the bees were hanging around outside the hive to keep cool. This hive is extremely strong with three supers on and ready to receive another. The heat builds up in a hive on hot days and the fanning by the bees is not enough to keep the hive cool. So some bees come outside the hive to make more air space. This phenomenon is known as "Bearding" A very descriptive word don't you think? It is now 21.30 and they are still covering the whole of the front of the hive, with a beard of bees underneath. I have only seen this once before in over 40 years of bee keeping.